We farewelled my brother-in-law on the weekend. He’s headed overseas for a little while, so I volunteered to cook him a departure feed. When I learned he’d had a hankering for Beef Wellington I was apprehensive, I’ve never made one before. Plus, pastry and I don’t always see eye-to-eye. Regardless, I figured as long as the red wine was flowing, my audience was likely to be appreciative. I’ve adapted a Tyler Florence recipe to suit Australians and those with pastry phobias. Chives, finely chopped for garnish. Add butter and olive oil to a large frypan over a medium heat. Add mushrooms, shallots, garlic and thyme and gently saute for 8 – 10 minutes. Cool slightly then, using a food processor blend to a paste. Season with salt and pepper and set aside to cool. Drizzle the beef with olive oil, rub with salt and pepper and the sear in a very hot, heavy-based pan. Sear all over, including ends – about 2 – 3 minutes. Cover bench with glad wrap and lay slices of prosciutto out into a rectangle large enough to encompass the beef. Gently spread a layer of duxelles over the prosciutto. Once the beef is seared, remove from heat and smear with the Dijon mustard. 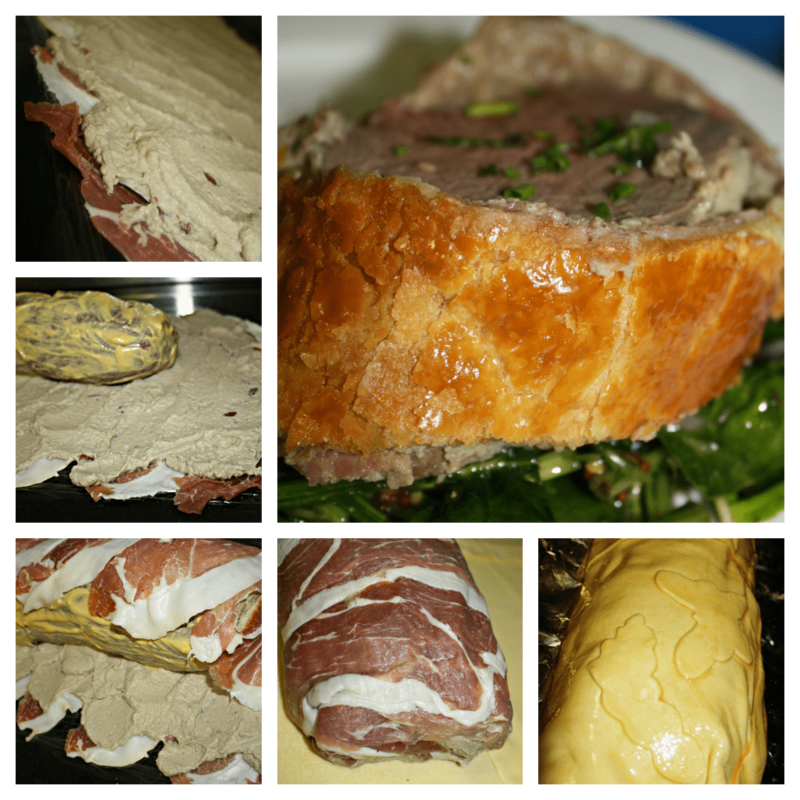 Allow to cool slightly, then using the glad wrap roll the duxelles covered prosciutto around the beef . Wrap tightly into a log shape and set in the refrigerator for at least 30 minutes. (I left it a couple of hours because it suited me to stop cooking at this point). On a lightly floured bench, lay out pastry sheets – joining the edges together carefully to make a rectangle large enough to encompass the beef (use the beaten egg to seal if necessary). Remove the beef from the fridge and cut off the glad wrap. 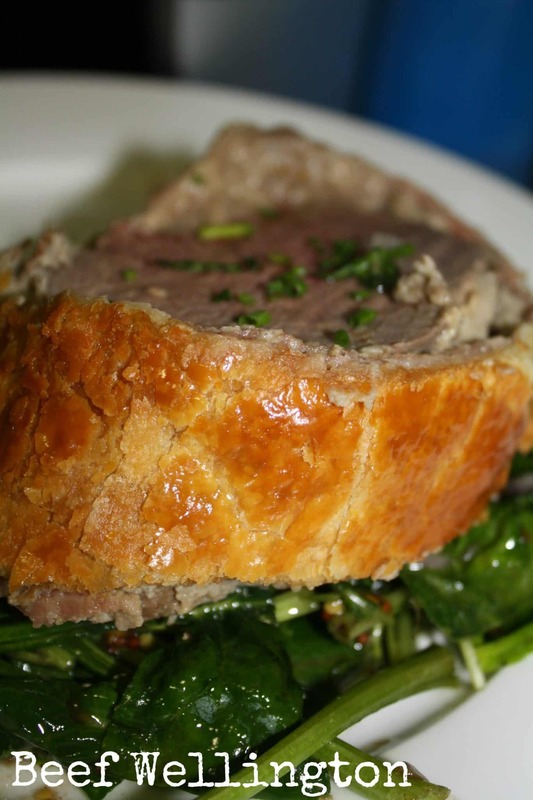 Place in the centre of the pastry and fold pastry over the beef, sealing carefully. Cut away excess pastry – you can use this for decorating the top if you’d like – ours got the butterfly and caterpillar treatment! Brush the pastry with beaten egg, and add some slits in the pastry with a sharp knife to allow steam to escape. Bake in the oven for 65 minutes or until a meat thermometer registers 65-70C (for medium done-ness). Remove roast. Transfer to a plate and rest 10-20 minutes before carving. Serve with wilted winter greens and green peppercorn sauce. It turned out wonderfully – my Sister-in-law declared that she won’t order Beef Wellington in a restaurant now, for fear of being disappointed. She also tells me that I made quite a few concentration-faces during the preparation process. Cons: There are a lot of processes in the preparation of this dish. It’s time consuming. Pros: It would be an ideal dinner party meal because all of the fiddly preparation can be done well in advance – leaving you free to mingle until serving time. Will I do it again? Probably, but I hope it’s a long time before I have to cook another farewell dinner. I made a Beef Wellington when I was younger and it was delicious – but yes, the pastry (and this was in the days before discovery of frozen pastry sheets) was daunting. Even more delicious cold as lunch the next day, believe it or not! !